There’s been an explosion in the words and phrases that are thrown around and applied to healthy living products. Artisanal, organic, sustainable, recycled, eco-friendly, and many, many others are used so frequently, and unregulated, that it’s sometimes hard for women to truly know what the terms mean and which ones are important to living a healthy lifestyle. As part of the POPSUGAR Insights 2014 Healthy Living Report, we wanted to test the relative importance of these types of words and phrases to better understand which ones were most important to women. We asked women to rank various healthy living and brand terms on a scale ranging from “extremely important” to “not at all important” to understand how important they felt it was for a brand to have the characteristic. Next, we expanded this experiment beyond words and phrases to include their overall brand experience, testing the importance of marketing communication channels like their website, their ads, their events, and their celebrity endorsements. Overall, trust is the most important characteristic a brand must posses in order to be considered credible to women. A total of 96% of women overall said that trust was “very important” or “somewhat important” to them when considering a healthy living brand. Women feel it is extremely important for brands to be able to separate their need and desire to sell a product and their motivation to help. Brands that are seen as offering relevant advice, perhaps from a topical expert, are more likely to be trusted, and trust represents the benchmark of a successful consumer relationship. 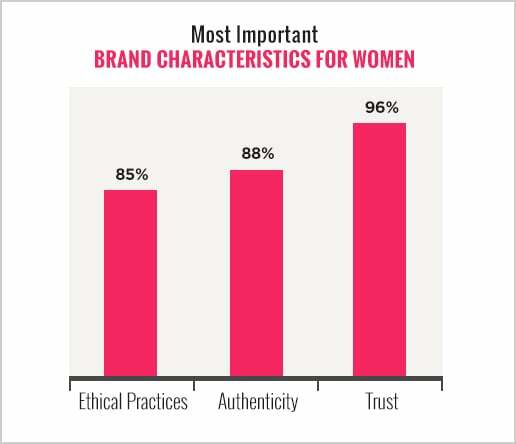 After trust, women felt that it was extremely important for a brand to be considered authentic. About 88% of women selected “authenticity,” and it’s not surprising, as trust and authenticity go hand in hand. Authenticity is a proxy for sincerity, and while women need to trust brands in order to establish a relationship, brands that are considered authentic have the ability to have a more natural relationship with women. Ethical practices ranked third overall with 85%. Among environmental topics, “eco-friendly (good for the environment)” (82%), “sustainability” (82%), “all natural” (73%), and “recycled” (71%) topped the list for women. The terms “made in America” (66%) and “organic” (55%) rounded out the list. In terms of marketing and marketing channel importance, women felt that having a “great website” was more important than having “great ads.” A total of 44% of women felt that having a great website was an important characteristic, while 36% of women felt having great advertisements was important. Slightly less important characteristics overall included “sponsoring events (concerts, festivals, sporting, etc. )” (27%), being “featured in editorial of magazines” (22%), and “celebrity endorsements” (11%).